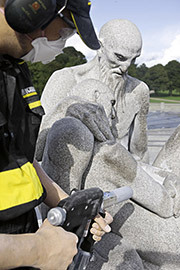 As part of its cultural sponsorship programme, in 2008 Kärcher set about cleaning and restoring the famous monolith and the 36 sculptures that surround it in the heart of the Vigeland Park in Oslo. Modern, gentle cleaning techniques were used in order to sustainably preserve the masterpieces and remove stubborn dirt which damages the stone. The work was carried out in close cooperation with Norwegian and German restorers and scientists. Over the years, pollution from emissions, bird droppings, algae, lichens, fungi and greasy deposits had formed on the granite surfaces of the sculptures. They were removed with heated high-pressure cleaners, without the use of any chemicals. Only hot water was used which removed dirt from the surface with comparatively low impact pressure. In some places, stubborn layers of dirt were removed with a low-pressure particle blasting procedure using a very gentle spray agent. Scaffolding was required for the work on the monolith, whereas the 36 sculptures were completely accessible from the ground. Vacuum sweepers and scrubber driers were also used to clean the plateau. The work took four weeks in total to complete. Gustav Vigeland (1869-1943) was one of Norway’s most famous sculptors. He dedicated the last three decades of his life to the sculpture park in Oslo. At the centre stands a granite monolith on a plateau into which 121 engulfed human figures have been carved. It is surrounded by 36 radial granite groups on a circular staircase which represent the cycle of life. The park contains a total of 192 works by Vigeland. © Copyright Med Marketing 2018. All rights reserved.